Effective crawlspace waterproofing will require addressing ground water leakage and controlling natural atmospheric humidity levels which are common in crawlspaces. When rain falls and soaks into the ground, it can raise the underground water table. When the water table rises higher that the floor level of your foundation, it will build up and create standing water on your floor. Passive crawlspace ventilation vents routinely installed by builders may not work to control your humidity related problems. In fact, these vents can even make matters worse. 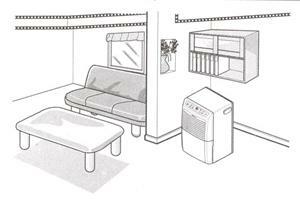 The cool temperatures underneath your first floor can actually cause your lower level to draw in the outside humid air. Condensation can then occur on your wooden beams and insulation. The B-Dry crawlspace waterproofing system consists of an interior drainage system to control the inside water table and remove the greatest source of water. B-Dry's Rigid Wall Sealer can be used on wet inside walls. Also consider a good basement dehumidifier to reduce atmospheric humidity and a good vapor barrier to reduce underground vapor drive. 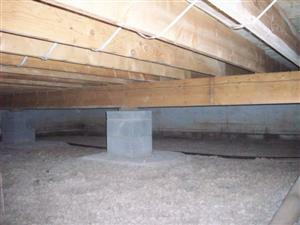 Remember, that addressing ventilation and moisture problems is important when waterproofing crawlspace problems.